The new Accelerate promotion from IHG is out for their last quarter this year. If you have missed the previous promotions you still have 10 days to register and join the 3rd quarter before the end of September. 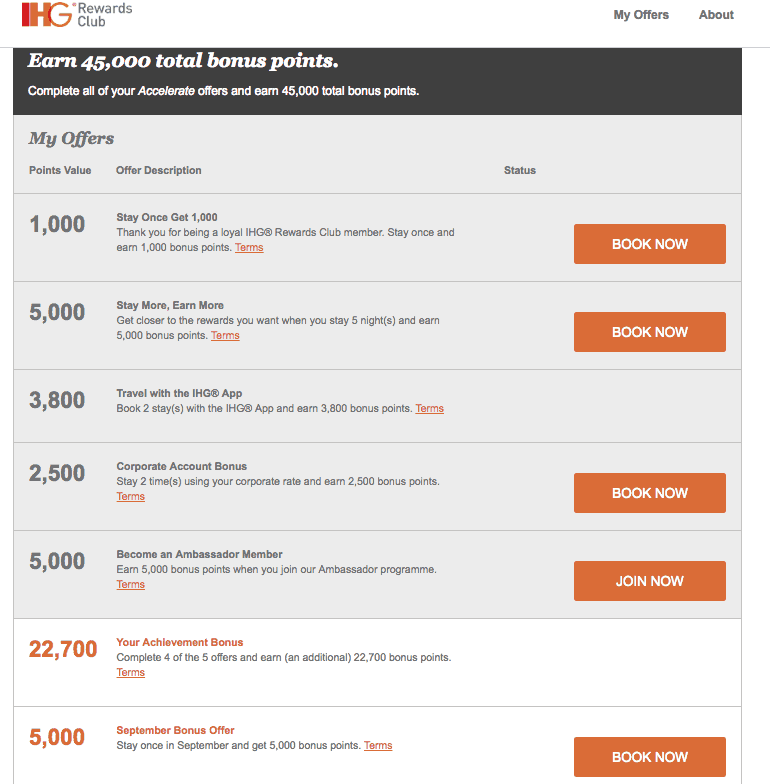 The IHG promotion is pretty easy to use and it is one of the most generous ones out there. Though this time seems a little harder at least for me. I still have not completed my husband’s promotion for this month, so will be working hard on this until the end of the month. The new promotion for on my husband’s account is, once again, much better than mine. We are both offered 45,000 points if we complete the offers. He needs to complete 4 out of 5 to receive 22,700 points bonus. I have been thinking of signing up for the IHG Ambassador programme so this might be a small push, especially since we are heading to Asia and there are some cheap Intercontinental properties there. My promotion, on the other hand, needs 4 out of 5 but it has less of an achievement bonus. This works well because as with this quarter’s offer I only run for the highest earning offer on my Accelerate. I didn’t have 6 nights of travel to make this worth it, so I decided to skip the offer and just use the 6 nights offer on my husband’s account. This way we received a higher bonus. 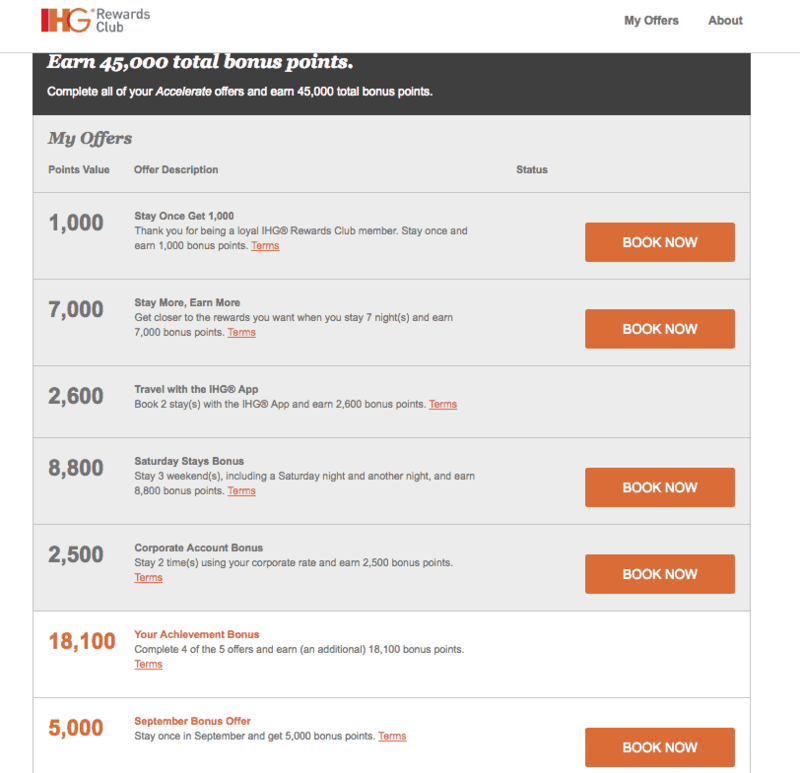 I will most likely not be staying 3 weekends in an IHG property just to earn 8,000 points. I prefer to take full advantage of my Hilton Diamond status with free breakfast, lounge, and upgrade. As always these Accelerate promotions are a great way to stack up some points. Always book and plan your promotions around your existing holidays so you don’t spend any extra money. I usually keep my points for stays in very expensive properties. Currently, I have decided to start hitting some of my bucket list destinations so I am dreaming of a Bora Bora trip in the next couple of years. I want to start collecting as many points as possible. Overall this promotion is not as exciting as some of the previous ones, but again it is not hard to achieve. You do get 5,000 bonus for just booking a cheap stay in September and I am sure I can find a property for a weekend away. You will also receive 1,000 points on your next booking, so for a cheap stay away in September for example, you will earn 6,000 extra points.